LET'S TALK ABOUT THE SIZE DOG YOU REALLY WHAT! LET'S TALK ABOUT TEACUP POODLES! You see teacup poodles almost everywhere these days because of their size. Airports, Stores, people walking down the street with teacups in a purse or bag of some type. They are very cute and everone stops and ooh and aah over them. It alway makes you what your own baby to love! Well, if you get one that is exactly what you will have is a baby! Did you ever notice that every time you see one they are in someone's arms? That's because they are too little to put on the ground in a crowd or a public street. You must be prepared to go the extra mile if you what a teacup poodle. 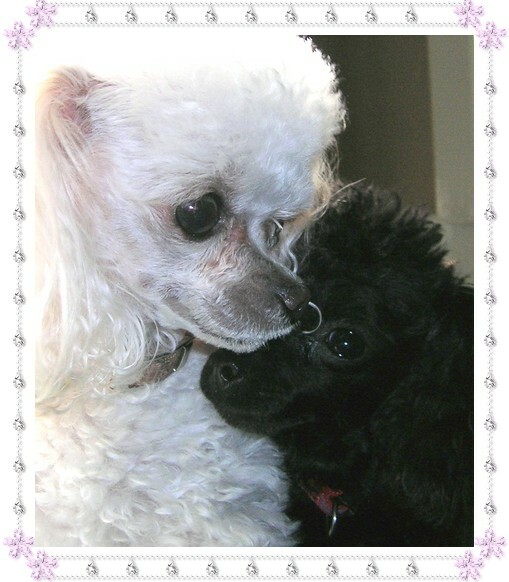 When I got my first teacup poodle, Elizabeth, she was 9 weeks old and weighed 15 ozs. She was not a good eater and of course you know they have to eat often. I came home for lunch everyday for a year to make sure she ate and didn't get stressed over being alone. About the time we had all of that worked out I decided to get another. Soooo we got Mandy. She was even smaller than Elizabeth was. She was not as picky of an eater as Elizabeth, she was just to busy to stop and eat! I had to force feed her for about a month before she got into the routine of eating and Elizabeth was mad that I got Mandy so she wouldn't eat for a while. Does it sound like kids to you? A teacup can't get on the couch or bed by themselves. It walks on the hardwood or tile floor like it was an ice cube and when you check their feet they are cold. And most everything bigger than them they are afraid of! It's almost impossible to board them anywhere because it is just to stressful for them. You have to have a friend or family member to keep them for you if you don't take them with you. And when you do go somewhere it is like having a baby! You need to take the pen they stay in, potty pads, food because they won't eat just amything, toys, NutriCal in case their blood sugar drops or they won't take a nap and the list goes on. Please don't get me wrong, I love the teacups but you need to consider your personal life style and make sure a teacup will fit into it. They can live for up to 18 years or better so make sure when you purchase a teacup that you are doing the right thing for the dog! HOW ABOUT THOSE TINY TOYS! Let's talk about the Tiny Toy Poodle. Here is a dog that is over 4 lbs. but under six lbs. Most ladies purses weigh more than that! The are not over 9" tall. You can go for a walk in the park. Teach them to use a doggy door and still carry it around in your arms, a pouch and so on. The are sturdier than a teacup but still small enough to dress up or play ball with. It is easier to find a baby sitter and able to be around children. Your tiny toy will learn to jump up on the couch, this I know for sure! The bed may be too tall but if you get a set of steps they will have no problem. To me it is lots easier to have a tiny toy but that is just a matter of preference. I have a lot of people tell me they want a teacup because they are unable to pick a bigger dog up. I would think most of the time it is the bending over that is so hard to do and if you have a tiny toy it would be able to jump on a chair or couch to help you pick him up. I have nothing against teacups, you just need to think about what you want in a pet and how much time you can devote to it.